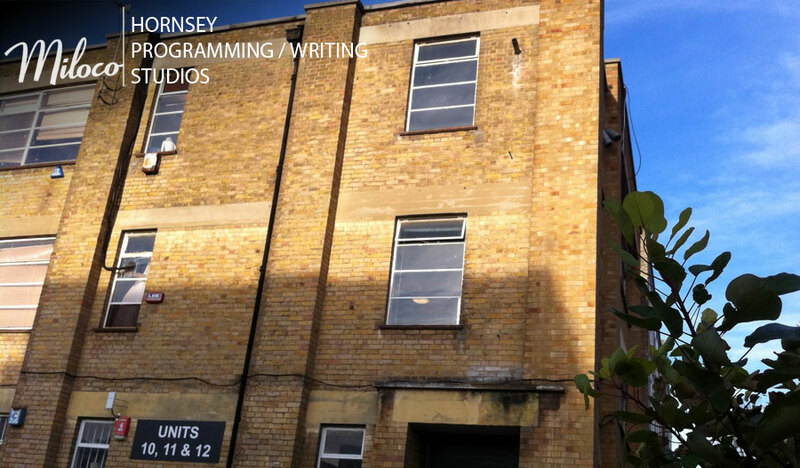 Miloco has six long-term let studios in Hornsey on the Hornsey Road. The rooms are on the first floor and come in various shapes and sizes. Nearly all of them come with booths some larger than others. All of the rooms are daylit, alarmed, air-conditioned and come decorated and treated. The floor has a communal lounge, kitchen and toilet. Currently unavailable: A great space for writers, programmers and musicians, this room benefits from a small booth, ample storage, Daylight, A/C and monitored alarm system. Currently unavailable: A great studio for writers, programmers and musicians, this spacious room has a recording area, separate booth, A/C and monitored alarm system. Currently Unavailable: The perfect writing/programming studio with a control room, live space and booth. It comes with A/C and an alarm and benefits from plenty of daylight.